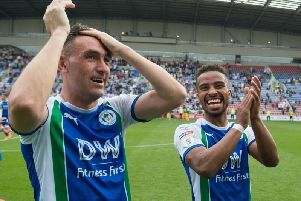 Wigan Athletic defender Antonee Robinson says looking up the table, rather than down, should be on the players minds as they take on Rotherham tomorrow. The on-loan Everton star will be hoping his new side can bounce back from last weekend’s defeat at QPR when they return to action at the DW. But while the result at Loftus Road scrubbed some of the speed off Latics’ strong start to the campaign, Robinson is confident their battle shouldn’t be for survival. Latics lost to Rotherham in the Carabao Cup earlier this month, but with a much-changed line-up what is usually seen in the Championship. And Robinson says they will cast an eye over their last clash with the Millers - a 3-1 defeat. “We’ll look over that game again and see how the opposition set-up, and we’ll look to bounce back from his defeat at home,” he said. Robinson has impressed since arriving at the club earlier this month, and the 21-year-old says he is already feeling comfortable at the DW Stadium. “I feel like the lads have welcomed me in really well,” he said. Robinson’s speed has also caught the eye of the Latics faithful, and he thinks Paul Cook’s attacking style of play suits him. And fans might have fellow Everton loanee Callum Connolly to thank for Robinson’s move to Wigan. Connolly is in his second loan stint at Wigan, and told Robinson it was a good place to be.